We have recently suggested that the warming in the sea surface temperature (SST) since 1900, did not occur smoothly and slowly, but with two rapid shifts in 1925/1926 and 1987/1988, which are more obvious over the tropics and the northern midlatitudes. Apart from these shifts, most of the remaining SST variability can be explained by the El Niño Southern Oscillation and the Pacific Decadal Oscillation (PDO). Here, we provide evidence that the timing of these two SST shifts (around 60 years) corresponds well to the quasi-periodicity of many natural cycles, like that of the PDO, the global and Northern Hemisphere annual mean temperature, the Atlantic Multi-decadal Oscillation, the Inter-Tropical Convergence Zone, the Southwest US Drought data, the length of day, the air surface temperature, the Atlantic meridional overturning circulation and the change in the location of the centre of mass of the solar system. In addition, we show that there exists a strong seasonal link between SST and ENSO over the tropics and the NH midlatitudes, which becomes stronger in autumn of the Northern Hemisphere. Finally, we found that before and after each SST shift, the intrinsic properties of the SST time series obey stochastic dynamics, which is unaffected by the modulation of these two shifts. In particular, the SST fluctuations for the time period between the two SST shifts exhibit 1/f-type long-range correlations, which are frequently encountered in a large variety of natural systems. 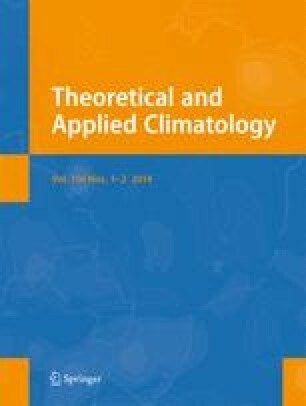 Our results have potential implications for future climate shifts and crossing tipping points due to an interaction of intrinsic climate cycles and anthropogenic greenhouse gas emissions. The authors would like to thank the reviewers for their fruitful comments and suggestions.